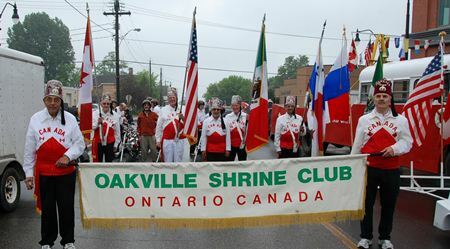 The Oakville Shrine Club is a very active Shrine Club that operates under the Jurisdiction of the Rameses Shriners, which is affiliated to Shriners International. The club has an active membership of over 100 members, who live in Oakville, Mississauga, Burlington, Hamilton and surrounding areas. If you are a Freemason in good standing, we welcome you to join us to learn more about us. The Oakville Shrine Club has an an active Scooter unit. We participate in a number of Ceremonials (in the spring and fall) plus Canada Day parades and Christmas Parades all over Ontario. If you are a Shriner and interested in participating in a parade with us, please contact us! Becoming a Shriner is easy if you are a Freemason in good standing. We welcome you to join us at any of our social or regular meetings to come visit with us, meet us and learn more about what Shriners are all about. We will eplain how each of us has a gratifying experience of supporting the Shriners Hospitals for Children and enjoying the fellowship of our fellow Nobles in the Oakville Shrine Club. Welcome to the Oakville Shrine Club web site. Regular meetings of the Oakville Shrine Club are held at Mo's Family Restaurant in Oakville. Mo's Family Restaurant is located at 467 Speers Road between Dorval Dr and Fourth Line. The Oakville Shrine Club meets regularly on the 3rd Wednesday of the month, except in the months of July, August and December. Some special meetings (June BBQ, Past President's Night, August BBQ, Christmas Party) are held at other locations. Please see the club calendar for location and times of these meeting. Some of these special meetings have no business transacted at them, so Fez's are not required. Note: There is a tariff of $25.00 per person for supper, and RSVPing for meetings is strongly recommended. The Executive meetings of the Oakville Shrine Club are held at Queens Avenue Retirement Home, at 1056 Queens Ave, Oakville, ON L6H 6R3. The Executive Meetings are open to the Club Executives only. The meeting is chaired by the Club President, and attended by the Ambassador, Secretary, Treasurer, Vice Presidents and Directors of the club.